Kicking off this recipes with wine article is an old favorite! If you have a sweet tooth and enjoy a glass of vino why not try these adult flavored gummy bears? They’re pretty easy to make too! Grab a silicone mold here and start the wine gummy festivities! A deliciously rich dish combines hearty ribs braised and seared in a red wine sauce… enjoy on a cold winter day to warm body and soul. Gourmet wine is such the popular item these days – lavender honey, vanilla basil, avocado cream…how about red wine and cream? A frozen, creamy, dreamy wine enhanced treat is a luxury dessert for a fun date night in! I love me some cheesecake! These scrumptious bars are topped with a little red wine gelée – sounds fancy right?! 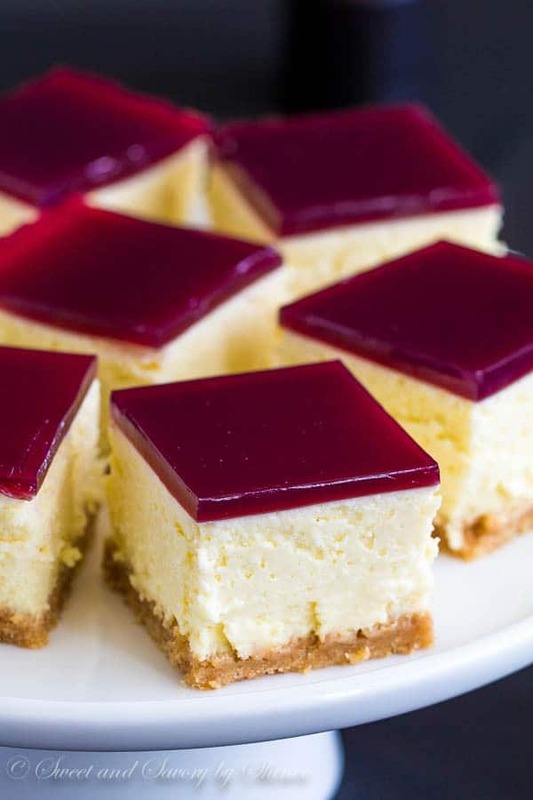 Impress your guests, and yourself with a this rich and appealing and slightly unique twist on cheesecake! This is hibernation food at its finest. Gather your root veggies, stewing beef, spices and herbs and splash some wine in your slow cooker while you enjoy a glass of your own. Turn on and continue your hibernation ‘til dinnertime. Bon appétit! Beef Bourguignon…a ‘Recipes with Wine’ classic! Recipes with wine must include this poignant dish; grab your Julia hat and go make this classic French dish! This is not a throw-in-the-crock-pot-and-leave-it-all-day kind of meal, it’s a little more classy. You will be glad you spent the time in the kitchen making this masterpiece though – Cheers to your efforts! Upscale your Mexican meal with these refined little bites! Great as appetizers or pair with some traditional Spanish fare. Bueno Apetito! Here are some more refreshing recipes for Sangria! Infuse your spaghetti tonight with wine! Not only does it amp up the usual pasta dish, but it turns it the color Red! What fun! A little creamy garlic parmesan sauce sprinkled with fresh asiago and BAM! Gourmet dinner. Recipes with wine don’t have to be complicated! Infused gummy bears and cocoa are just two examples. Have fun with these recipes with wine and Cheers!